Im sure its out there somewhere, but I didnt find it. If you need to login to the base unit for the wireless 930D, its userID= admin and password is the last four of the base's mac address. Hopefully this will work out for you. It did for me. 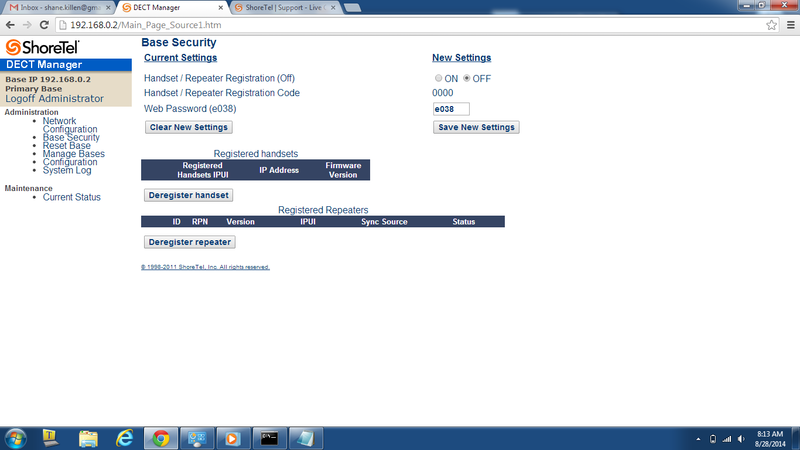 See the screenshot below of the "Web Password". In my case, you see e038. Do you have any first hand experience with these phones? What kind of range do they get? I need one for a warehouse/yard environment, and I'm not sure if these will do with just one base and DECT instead of 802.11. I have first hand experience with these phones, and the range are overall very good. What kind of distance are talking about? Will you have LOS with the wireless receiver? Brocade Switch: "TFTP to Flash Error - code 5"
Cisco Switch/Router/ASA: "Exec-timeout 0 0"